February is coming to an end and I have to admit I haven't completed my Lovely Year of Finishes goal for this month. I have made great progress and have the top completed but have decided to take my time with the machine quilting let me show you why. Here is how I put this pixel top together. I used some 820 Pellon fusible grid and iron each of the pieces onto it to form my quilt top base. This is what the back of the grid looks like and you just layout a couple rows and iron them for 5 to 10 seconds with a hot, dry iron and your fabrics squares will then stay put so you can move on to the next step. You just turn the piece right sides together and row by row sew each of the row from top to bottom across the whole project in one direction. If you find yourself wondering what the thing to the right of my presser foot is(that says tape side), it is just a magnet strip that I sometimes like to use when I want to maintain a 1/4 inch seam allowance. I just use it as a guide to run my fabric up against. This is what it will look like after one direction is completed. The next step is to open each of the seams with a pair of scissors and iron the seams open. It takes a little time to get the scissors in the seam and cut open but it is very doable. After each of them is sewn across the whole top, repeat the seam opening procedure and iron the seams open again. At this point, even the back looks pretty nice but the magic is how perfect the front turns out. The seams line up so nicely...much nicer than if I had tried to put this together block by block, row by row. At this point, I was pretty pleased with the whole project and decided to take it to work to show off. I work with a lot of young 20 somethings and thought they would get a kick out of the skull in the center. Not one of them could spot the skull in the center! WTF was what came to mind. One even guessed it was a panda. Again WTF??? Made me seriously wonder what I could do to bring out the center of the quilt. I think each of them was so drawn to the array of colors and the individual pieces of fabric that they weren't seeing the overall project. Even when I told them what to look for they had a little trouble finding the skull. I know that my original post received NO comments. Is everyone having trouble seeing the skull or just my non-quilting friends. 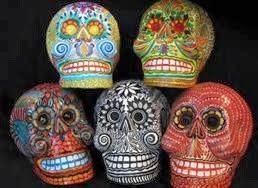 I choose the project because it reminds me of the Mexican skulls used to celebrate the day of the dead, Dia de los Muertos. It is a big celebration in Southern Mexico to honor a families dead relatives. In most Indian villages, beautiful altars are made in each home to honor the dead. They are decorated with candles, flowers and lots of food. Little folk art skeletons and sugar skulls are included in the many decorations and festivities. I think I should add this kind of free motion quilting to the skull. I do think part of the problem is my skull is a side view but the back of the brain cavity should be very identifiable. I do worry that this much quilting will just add to the confusion of the top but I think it may bring the eye to the center of the quilt if I do it right. 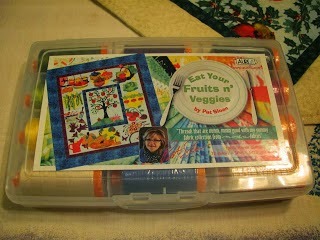 This week I received my fabulous win from Cindy at Quilt Doodle Designs from the 2013 BOM that she held last year that Aurifil sponsored and I think the bright colors will be fabulous in my skull candy design. Thank you Cindy and Aurifil for the 12 fabulous spools of thread they will certainly get a lot of use. In the meantime, between doodling up what should be my FMQ design for this project. I have started a new medallion center for a quilt-a-long with the Portland Modern Quilt Guild. In February, Karen from The Recipe Bunny and I decide to become members of the PMQ Guild. It was our second meeting we attended together and it has been a lot of fun getting to know Karen and seeing what our local Modern Quilt Guild is doing. It is a rather large chapter and lots of things going on and lots of show and tell. Karen even took a quilt she had just finished for her husband for Valentine's Day for show and tell. So many of the medallions they had displayed at the meeting were so traditional and not what I expected from a Modern Quilt Guild. I want something with a more modern feel for the middle of my quilt so I am putting together my own design. I can't wait to get it all sewn together and show it off here. I chose a few fabrics from my stash to work with for the colors on this one. At some point, I may need to shop for more in these colors but I have enough to get started. You made me actually laugh out loud with the reaction your coworkers gave you. I saw the skull right off the bat in your first post. Before I read anything I had wondered if it was intentional or not because 1) you don't see skulls in quilts very often and 2) the color burst quilts are very popular. I think the skull is great and you can definitely tell it is there. I would probably do tighter quilting around the skull in the background pieces so that it makes the skull puff out. The do a larger motif inside the skull. And, your medallion fabrics are gorgeous! Can't wait to see what you come up with! I love all the colors in this but to be totally honest I really don't see the skull either.